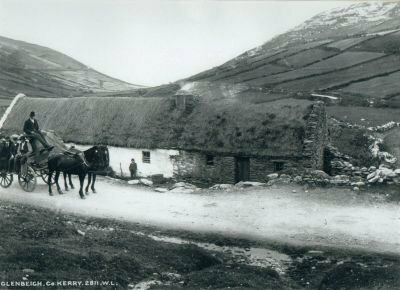 "I purchased these old photos in Kerry recently, the date for all of them is unknown, but estimated to be 1880-1885." Thanks to Tony Riordan for the pictures and the commentary. Click on the thumbnail image to see a larger copy. 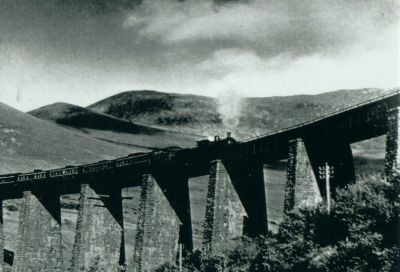 This shows a railroad train that ran between Tralee and Mallow, by way of Killarney until the early 1960's. The bridge still looks this way in 2000, though the train stopped running and the track is abandoned. The bridge is located in Kells townland, only a short walk from the farm of my great grandfather, John J. Riordan. This was part of the Mallow - Tralee line, the first Kerry rail line. It was built by the Killarney Junction Line. 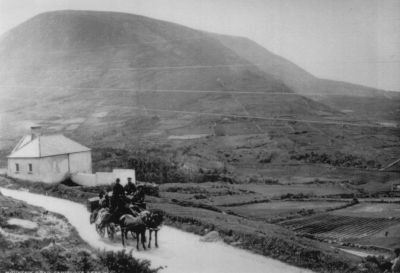 The first part, from Mallow to Killarney, was opened in 1853, and the rest extended to Tralee in 1859. So, this bridge was built before 1859. This would have been the train that most emigrants rode from this area, first to Mallow, where they switched to another train enroute to Cobh Harbour, County Cork. This shows the National School in Kells. My grandfather walked to school here. It looks just like this now. Note that the mail wagon carried passengers, too! 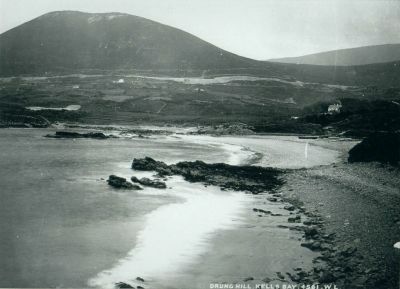 This shows Kells Bay. The big house on the right with the smoke coming from one of the chimneys is called Kells House. The landlord here, Rowland Blennerhassett, built it as a hunting lodge. Eventually he moved there from Tralee area. My great grandfather's house is the white house closest to the left side of the photo. At least two generations of Riordans farmed the land from the house down to the bay, a total of 118 acres, held by two separate leases. The hill in the background is labeled "Drung Hill" but from my maps it appears to be Mt. Foley.